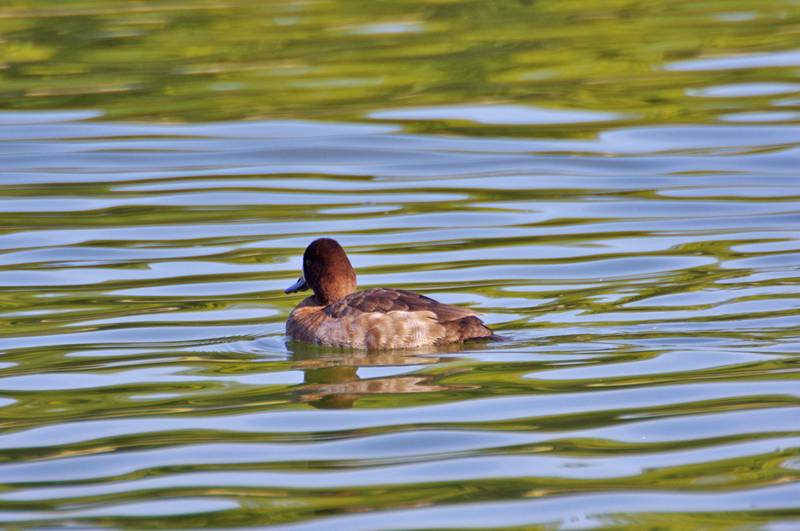 The Greater Scaup is found primarily along the seacoast and on large bodies of water. 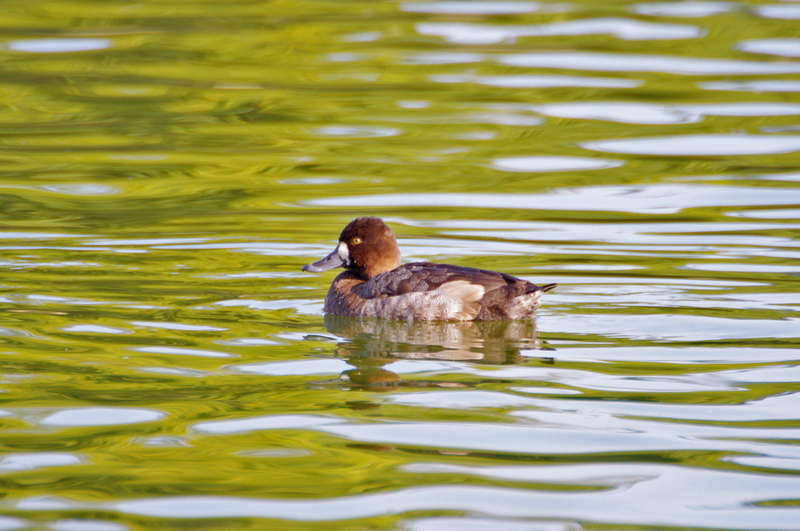 Unlike its look-alike relative the Lesser Scaup, the Greater Scaup is found across Eurasia as well as North America. 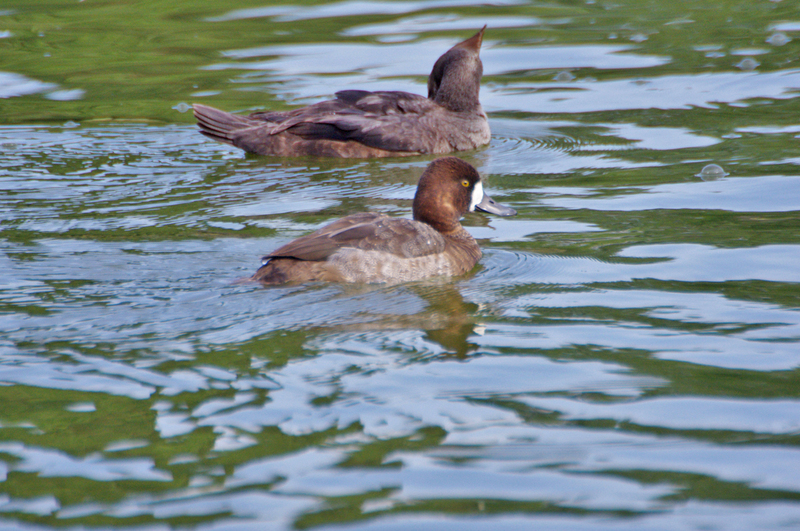 Occasionally an older female Greater Scaup will have male-like head color and male patterning on her back, but she still has the typical white face patch of a female. 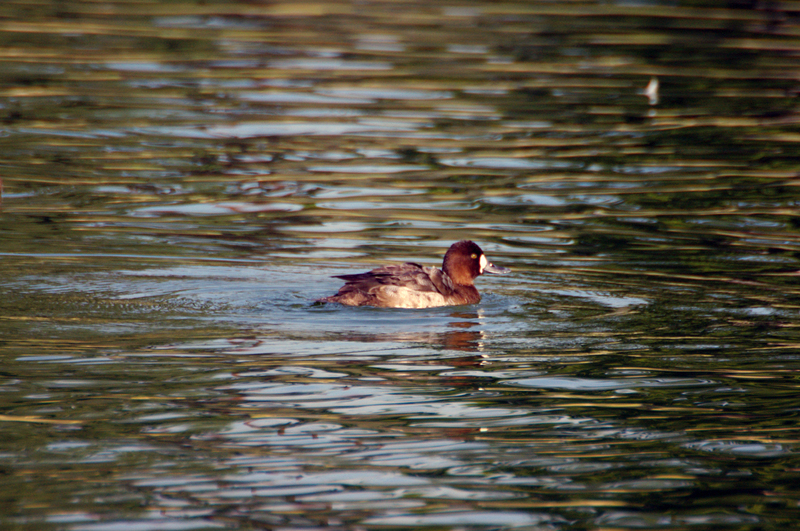 Once incubation begins, the male Greater Scaup leaves the female and goes to molt on some relatively large, isolated lake. 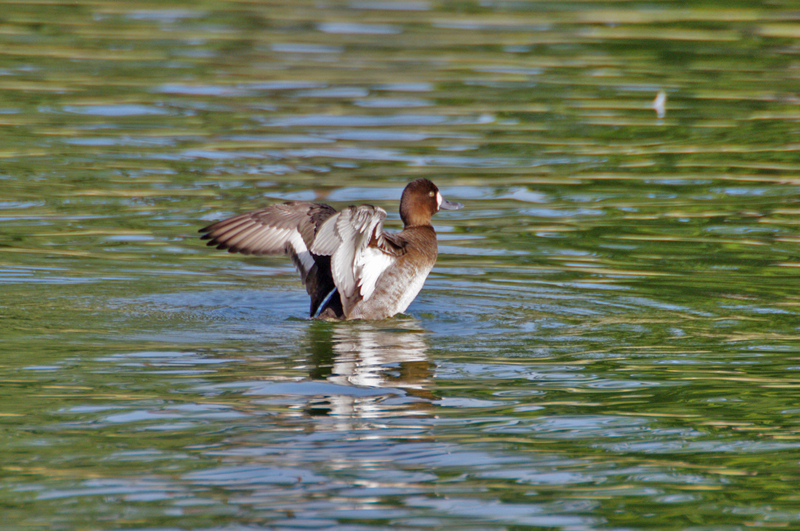 These lakes are used year after year during molt, and may be in the immediate vicinity of the breeding wetlands or many miles away. 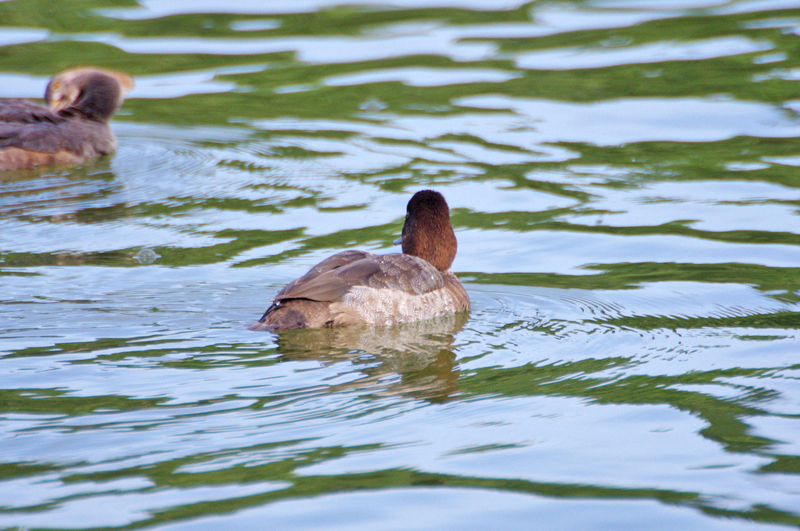 They are relatively shallow and contain abundant food and suitable cover. 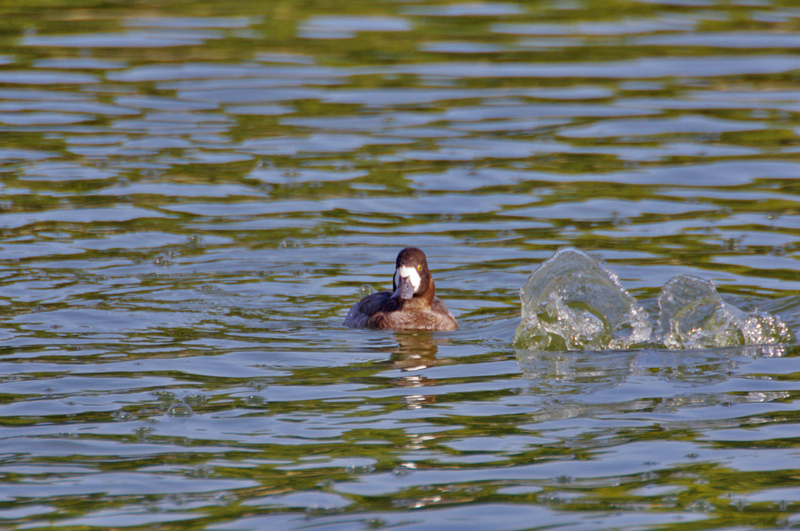 The nest of a Greater Scaup is usually lined with a thick layer of down plucked by the mother from her own breast. 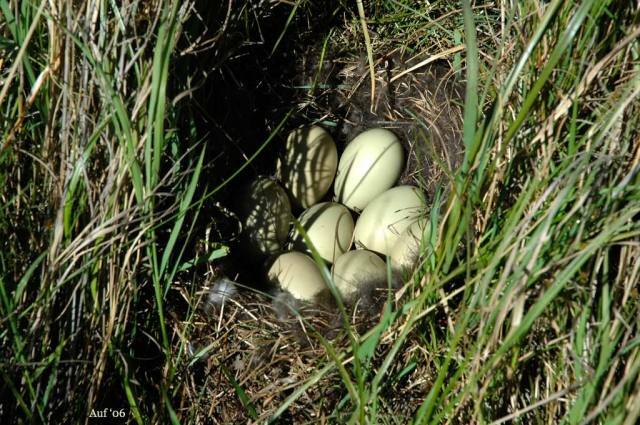 Nests of poor-condition females may lack down and instead may contain small, grayish-white feathers plucked from beneath the outer body feathers. Bill bluish with black tip. 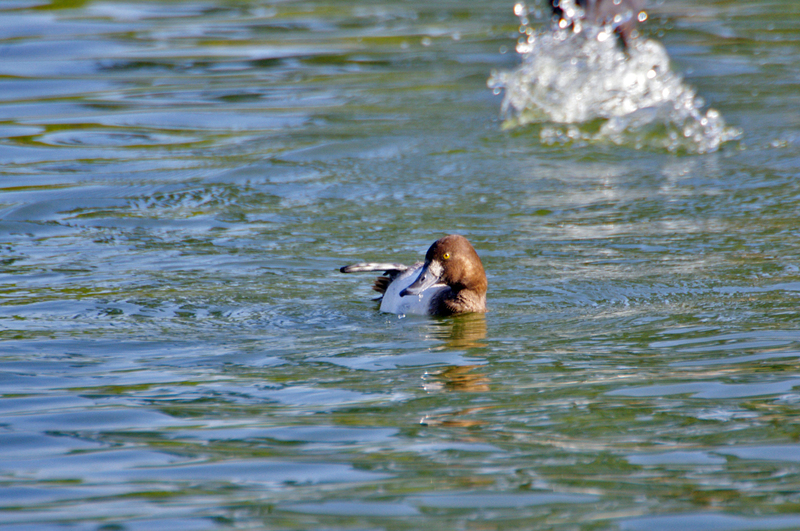 Male with black head, chest, and rear end, and gray sides (black on the ends and white in the middle). 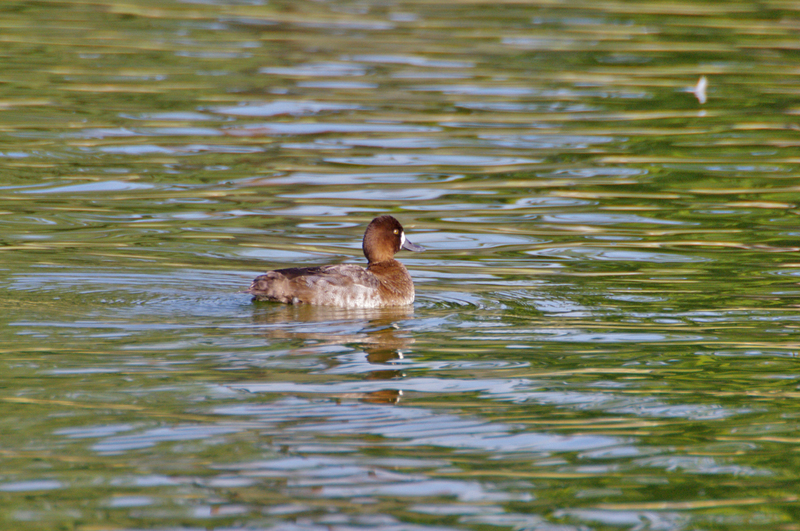 Female dull brown, with white patch on face at base of bill. 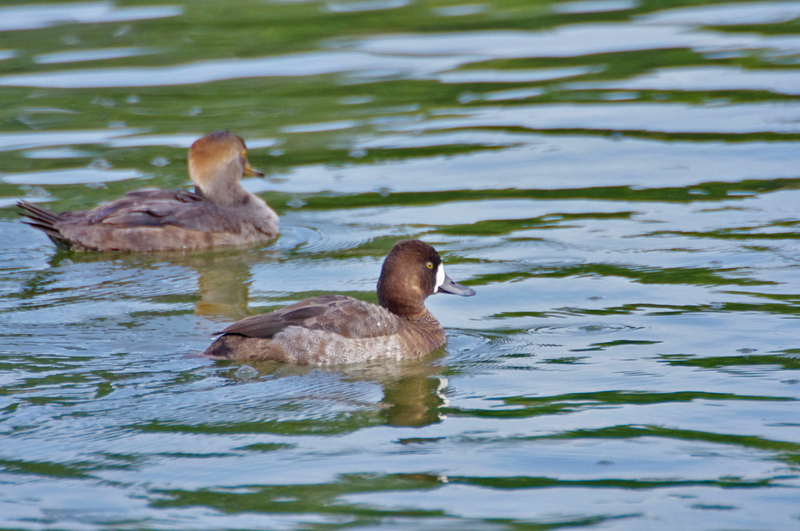 Head, neck, upper back, and breast black; head with greenish iridescence. Back white to gray, covered with thin, black wavy lines. Rump black. Belly white. Sides white, with some fine dark streaks. Undertail black. 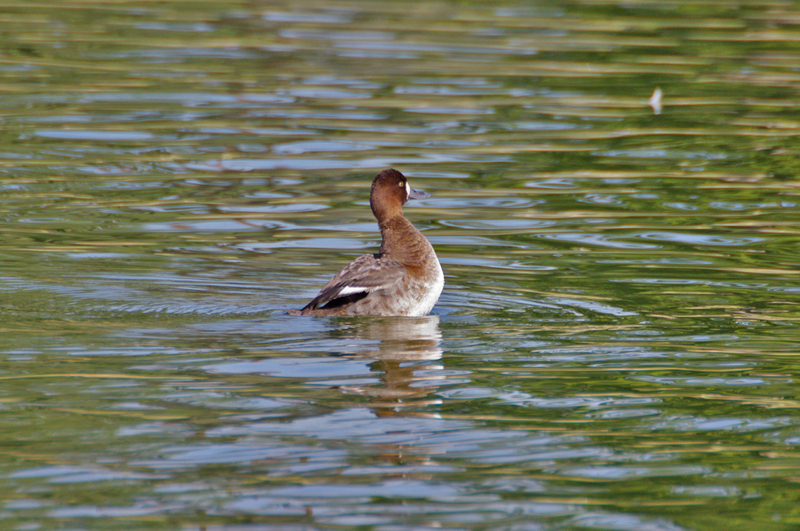 Similar to female, but with only a few white feathers on face instead of a large white patch. 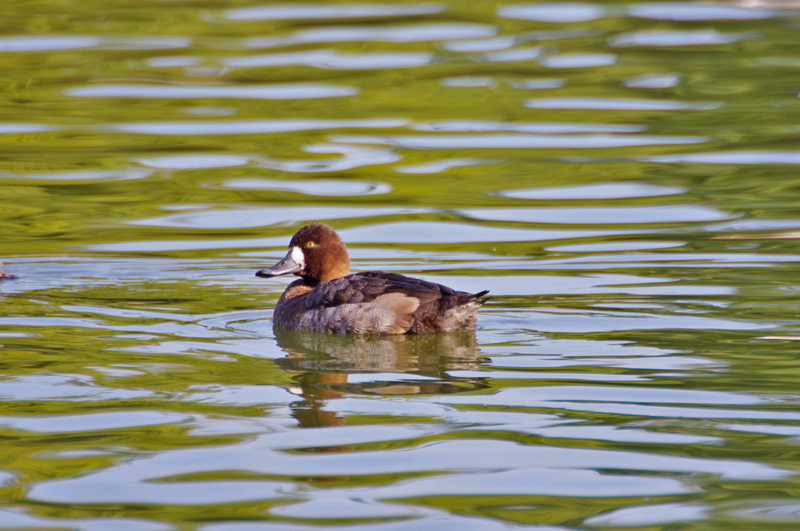 Head and neck blackish brown, lighter on cheeks and chin. Breast dark with some white edging to feathers. 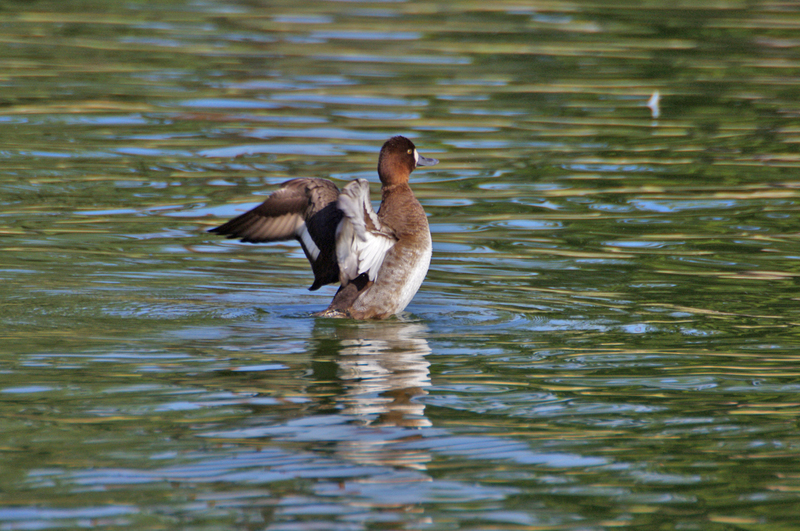 Back brown with white edges to feathers. Underparts mottled brownish and white. Tail dark grayish. White area at base of bill. Head and neck dark brown with some light mottling. Back darkish brown with white flecks. Breast buffy brown. Belly whitish. Sides and flanks brown. Tail dark brown. 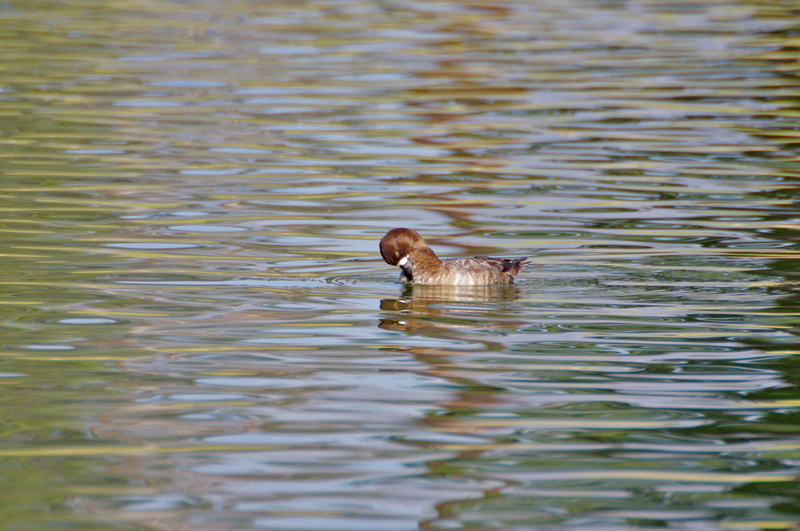 Found on lakes, ponds, and bays. Mostly marine in winter. Clams, snails, crustaceans, aquatic insects, seeds, and aquatic plants. 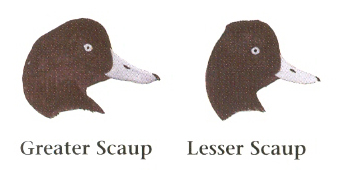 Lesser Scaup extremely similar, but is slightly smaller, has bump on back of head instead of a smoothly rounded head, a smaller black nail on the bill tip, and has white stripe extending only halfway out wing. 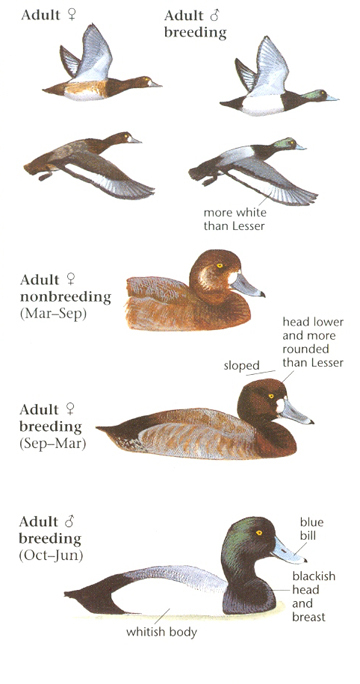 Male Lesser Scaup shows purplish or sometimes greenish sheen on head and usually duller white sides. 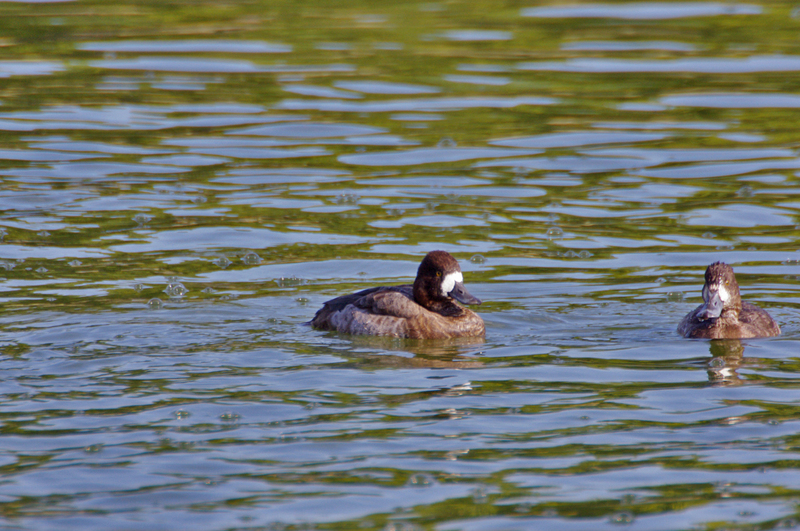 Male Ring-necked Duck has black back, white shoulder, and a pronounced bump on the back of the head. 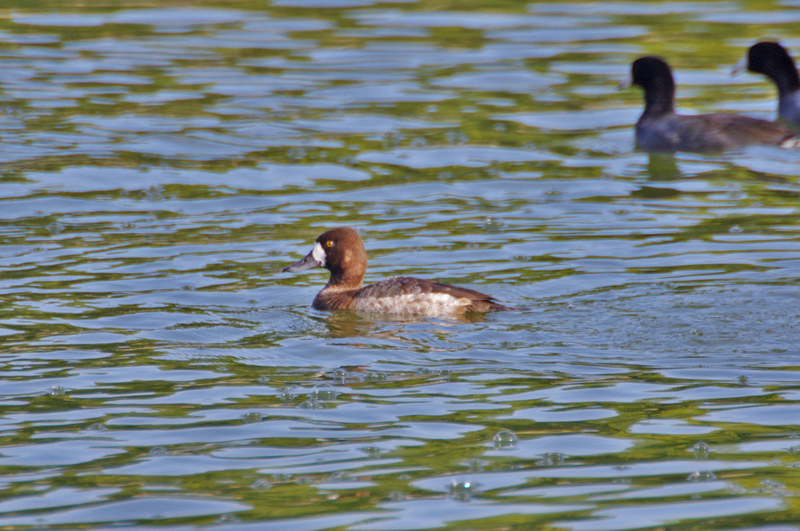 Female shows ring around her eyes and a white spot on the bill. Male makes a soft, fast whistle. Female makes hoarse, raspy "arr-arr-arr."